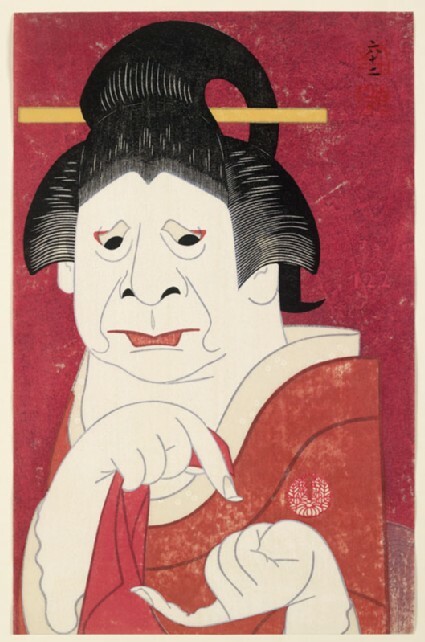 Like earlier print designers, Kōkei depicts moments from actual performances, and his prints were primarily sold at the Kabukiza Theatre in Tokyo until he stopped making them in 2000. The actor Onoe Baikō VII (1915-1995) was one of Japan’s leading postwar onnagata (female impersonator), who also specialized in the roles of handsome young lovers. He was designated a Living National Treasure in 1968. Kōkei’s portrait, with its exaggerated depiction of the actor’s expression and hand gesture, captures the climactic moment of a kabuki play known as a ‘mie’.